You know funny enough, we actually have three Magnezones in the format that do effectively the same thing, until rotation officially hits – two of which do the same thing for the same Type. Go figure. Magnezone is a Stage 2 Lightning-Type Pokemon, 150 HP, with a Fighting Weakness, a Metal Resistance, and a Retreat Cost of 2. It’s pretty much the same card as the one from Ultra Prism, complete with Magnetic Circuit specialized towards Lightning Energy and Zap Cannon, a 4-for-130 move that prevents him from attacking the next turn. I mentioned we have 3 Magnezones that ended up doing the same thing, and that’s because Magnezone from BREAKthrough also has the Magnetic Circuit Ability – and being a Lightning-Type, it fuels Lightning just like this one. So Lightning decks can rejoice in the fact that they will continue to have their Stage 2 magnet buddy pumping out Lightning Energy from their hand each and every turn. Not to mention its attack is better than the old Thunder Blast, but no one was attacking with Magnezone anyway. Needless to say, this is good for Lightning decks in general, but right now we don’t have any major Lightning decks competitively. Sure, there are things like Raichu-GX and Vikavolt-GX, but those are already running huge evolution lines in those decks anyway, and neither really needs something like Magnezone in them, as they’ve already got ways of pushing out more Energy quickly from the deck. Still, not all hope is lost for Magnezone, as he’s got at least the next two years for another Lightning Pokemon to enter into the game. Not to mention he’s got a lot of partners for Expanded. Arora Notealus: Should’ve just called him MagneUFO. It’s basically what he is, you look at that shape and tell me he’s not a UFO! Side Review: Cacturne – oh yeah, I missed out on reviewing the cards from this week. Spike Rend offers cheap damage if you’ve already hit your opponent’s Pokemon, but it feels a little too late for what it’s worth. Tack on an underpowered Pokemon Catcher that only does 40 damage, and he’s not looking too good in the long run. Maybe he’ll get a GX counterpart that’s better? Next Time: Burning up the fuse up here alone…with a fox? So here’s the bottom line this week. We are a bit of an limbo so we decided to look at a few more cards from Forbidden Light, two Promos, and an infamous banned card from Neo Genesis. That’s probably gives it more time to analyze newer cards before the crew put their thoughts in. Also, I would be rating Standard as if it was Sun & Moon onwards. Today, we’re looking at what it would be Motivated Mondays because Magnezone gives you an incentive to keep you energized. Magnezone can be based on two cards. While it is based on the Ultra Prism version due to copying attributes and effects verbatim sans type, it’s ability originated from the BreakThrough version. 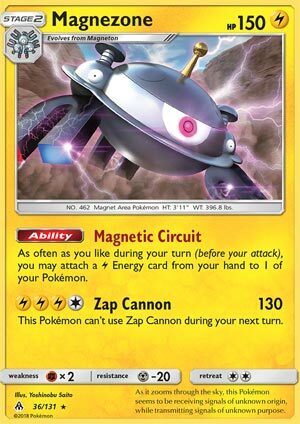 I did not consider this card to be in the top 10 cards of Forbidden Light because I did not want a third Magnezone that did the same thing to be on a third top 10 list of the set. Unlimited energy acceleration is a wonderful trait. It allows you to meet any attack cost with ease as long as it is the appropriate type and you have the energy cards from your hand to attach. In Magnezone’s case, you can meet any attack that costs L or C with ease without using up your manual attachment. Overall, this can make certain Lightning typed attackers viable to use. What about Zap Cannon? I say that this attack can reach 2HKOs and even if you can’t attack on your next turn, you can perform the pseudo switch tactic so that the clause gets reset and you can use that attack again. For a Sun & Moon Format, that means using Dawn Wings Necrozma GX with Altar of the Moone and Psychic energy or Unit Energy LPM. I have to say though, Magnezone might just be in its own deck without Lightning type GX/EX beatsticks. What? How could this be?! Lightning type support. Mostly Thunder Mountain Stadium Prism Star Card and Electripower. Those two can push a support Pokemon into a very good attacker. Zap Cannon becomes LLC instead of LLLC with this Stadium card that can be bumped to 160 damage with Choice Band. Then Electripower can be used as many times as you like. With one use, you reach 190, enough to KO some mid to high Basic GX/EX Pokemon. With two, it’ll OHKO some Stage 1 GXs, and three uses mean you’ll OHKO anything in the game. This support Pokemon could be trading prizes very well! Pretty impressive for this Magnezone card; it can be both a Supporter and a decent one-prize attacker……unless you’re staring against a Buzzwole deck, which in this case, it must sit on the bench unless you are confident that you can OHKO Buzzwole-GX.